I believe this is Charlie Tunic #5. I'm the type of person who'll have one style of cardigan in every color. Weird? Nah... I just know you can never have too many good sweaters. The same goes for sewing patterns. If I like it, I'll make a gazillion in different variations. This time around I made the tunic minus the sleeves. Perfect for this time of the year... a great layering piece. The fabric is of Japanese linen/cotton blend from Kiyohara. You can find it here. The accent fabric is from JoAnn's and the buttons were from another local fabric shop. Layering is key here. 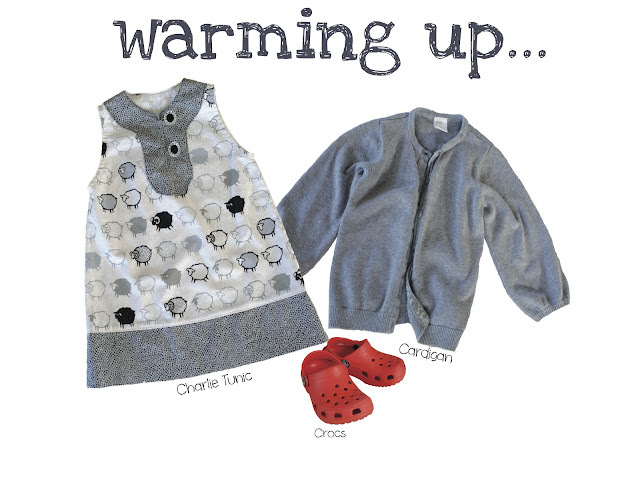 Warm or cold, it's great to have options and not to mention, maximizes your wardrobe. I'm all for that! Okay Crocs... do you love 'em or hate 'em? Mr. loves his (personally, I think grown men should NOT wear these things) and Lala does too. She has both red and orange pairs and the first couple of weeks she had them, she literally wore them 24 hours a day. The only time she'd take them off was during bath time. Good grief! The shoes claim to not stink... I BEG to differ. Lala's feet were pretty ripe after a few days. So do you have multiple of a favorite thing or an usually deep "appreciation" for Crocs? Please tell me I'm not alone. Okie-dokie folks... I'll be linking up over at One Little Momma's Blog. Ugh! AdorABLE!! I like you're little 'styling'sections too. Thanks Sophie! I finally figured out how to do this via Photoshop. Venus, regarding Crocs...I love the ones that are different like these http://parrishplatz.blogspot.de/2009/06/i-never-would-have-thought.html and I have croc snow boots which I LOVE. I own a knock-off pair of bright pink traditional corcs for going out to check mail and take out the trash and I'm always embarrassed if someone sees me and truthfully think they are ugly as sin. I too agree that no man should wear crocs (sorry Mr.!) unless they are black or not the traditional ones or your're a vet or dr.:) For kids I feel differently. They look adorable on most kids. I say most because it's usually the color and the jibbitz that make me cringe. Now for buying in multiples, I am really bad about that. I get it in my head I need all the colors or 6 of the black ones, etc. I just spent a big chunk of change at Jcrew buying their vintage v-neck, boat neck and long sleeve tees in all the dark colors and multiples of them. I love them and what if I tear one or they stop selling them, etc. I see nothing wrong with it:) The problem is when your coworkers think you are wearing the same thing over and over. NO! I just own 6 of those black v-necks!! I love this sheep dress and the styling!v LOVE it!! She is adorable and I can see why you make a lot of stuff for her. *phew! * Thank God, I'm not alone!!! HA! That's the same logic I use to justify my need! adorable!! i've been just a blog reading slacker... determined to catch up, i open my reader and you're right at the top with this loveliness :) what a great way to start my day!! also, i'm with you on the multiples. i do it with cardigans and t-shirts. Okay, Tom's are cool. I just wish I could fit into them... I'm in between sizes. Grrr! I guess that's a good thing, otherwise I'd be on the same boat as you! I adore that tunic and the style boards are brilliant! You rock! I LOVE this! Charlie Tunic is a pattern I've always struggled with because it almost seems too boyish for a girl but too girly for a boy. But eliminating the sleeves makes the perfect little girl dress! 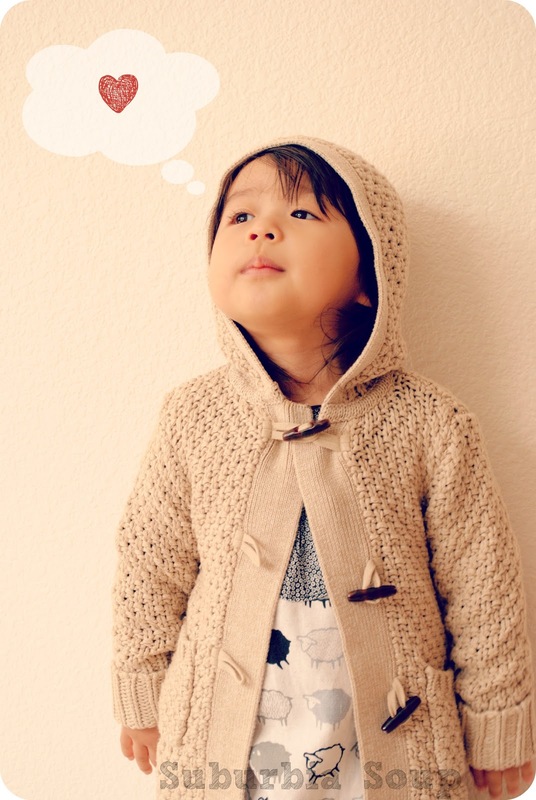 I am definitely giving this pattern another go for my daughter. And I totally agree on the crocs. Should never be worn by adults (except doctors and nurses and for gardening). They are cute on little kids -- my kids love theirs -- but really start to stink after awhile. I can see where you struggle. Perhaps the choice of fabrics? If you noticed I also altered the contrasting fabric detail around the neck line. Rather than having it angled or even just straight across (along the bottom, below the buttons), I rounded it off. For me, it softens the whole look. 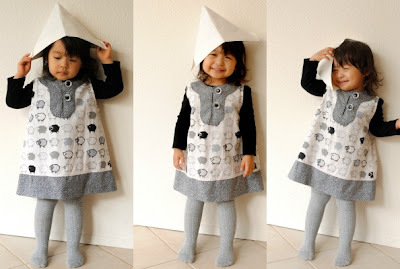 She is so cute and I love, love, love the Tunic! Thanks Michelle! Just like my sweaters... you can never have too many! Oh my darling! So stinking cute. I love, love, love the sheep fabric and your outfit pairings. Love it. Great version of the tunic! When you hit on a great pattern is so tempting to sew up more versions- since they tend to go faster the more you do. If you can get your Mr to give up his crocs maybe you can start on mine next! At least he mostly wears them for lawn work stuff in the summer, but yes the cuteness factor greatly decrease as the size of them grows! Love this tunic! I think you're right about the layering of it with no sleeves. Just out of curiosity how did you make it sleeveless?